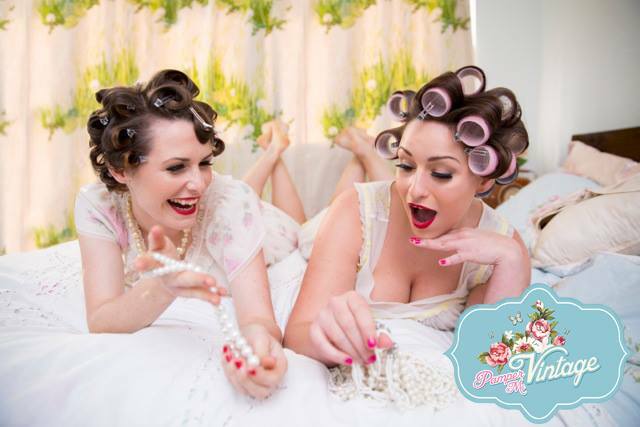 I’m currently knee deep in vintage nighties & slips getting ready for a wedding fair this weekend – my very first event with a stall dedicated to nothing but nightwear & lingerie, plus a little linen & lace for your vintage trousseau -eek!! exciting but a little nerve-wracking too! One of my (many!) 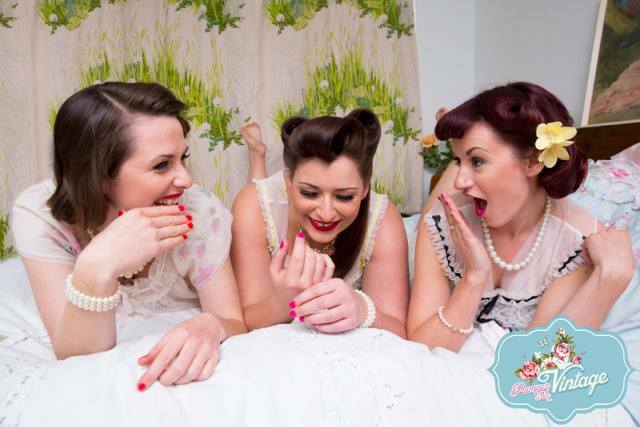 inspirations for aiming my collection of vintage nightwear towards the wedding market is the idea of dressing in cute, colourful nighties & bed-jackets for your get together with your bridesmaids, your hen party or how about a vintage pamper evening? Which called to mind an occasion a little while ago when I loaned out some of my Baby Doll nighties to my friend Claire of Luxurious Hair and Beauty who was collaborating with another friend, Amanda of A S Bridal Make Up on a new occasional project called Pamper Me Vintage where they were doing just that – a range of special packages for vintage pamper parties & evenings. 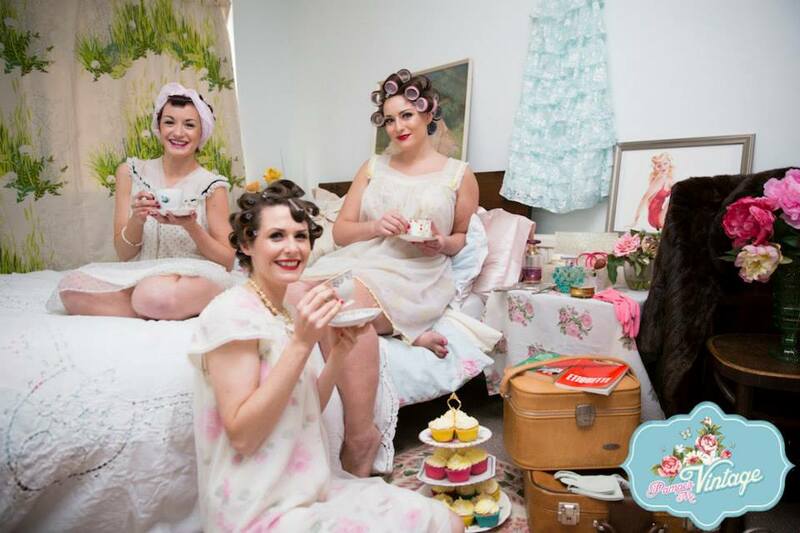 All of the images with the Pamper Me Vintage logo are from their promotional photo shoot using Baby Doll nighties on loan from Wake Up Little Susie, with the fantastic images by J Andrew: Film & Photography. This did lead me into an idea that I had been thinking about for a while, should I loan out collections of clothing as part of my business? Still on the to-do list as there are considerations, but it’s a thought as these photos are fab! So, getting married? Birthday? A girlie get together for no other reason than getting together with your buddies? 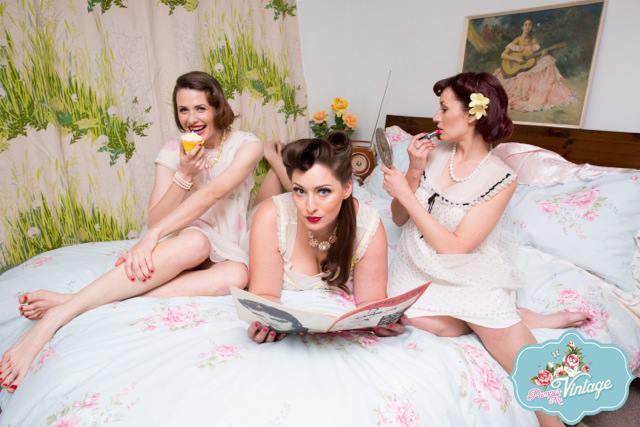 Then, what could be more fun than dolling up in something vintage & pretty prior to drinking cocktails & eating cake, or how about a full on old fashioned ‘Grease’ style slumber party or sleep over? Get out the nail polish & curlers, pamper each other up before moving on to hot chocolate (or cocktails) & gossip! 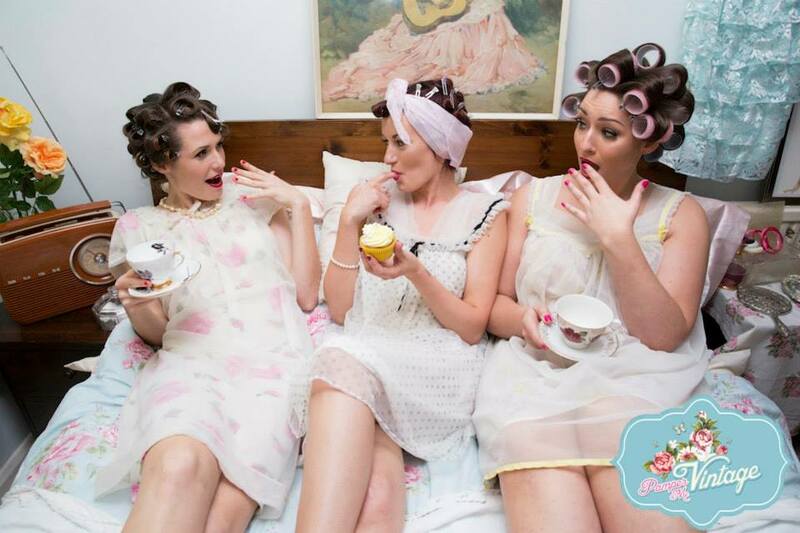 Either way, vintage nightwear is a must whether you go for the pretty baby dolls, cute bedjackets or teen style PJs! These are from a photo shoot I did a while ago to create a story of a Slumber Party with models Heather & Marie, images by Stephen Plumb. This party ended in the obligatory pillow fight! 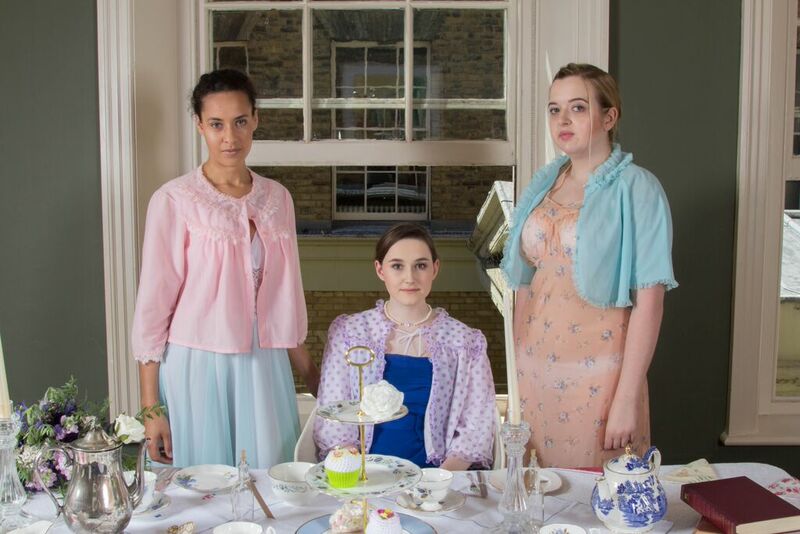 This is a real secret peak, as these images aren’t available to the public yet… Anyway, it’s back to sorting out bed-jackets & nighties for me and until the next time, don’t forget to pamper yourselves, vintage!